Naples is widely considered the star attraction of Southwest Florida – a little taste of paradise with something for every lifestyle. This city is home to miles and miles of sugar-white sand beaches that border the warm, sparkling waters of the Gulf of Mexico. It also serves as a meeting point for various different cultures from across the globe and this is reflected in its cosmopolitan and ever-evolving aesthetics. And yet, despite its luxurious and upper-class appearances, Naples is an affordable community ready to welcome just about anybody. The greater Naples metropolitan area has been growing continuously for over 30 years and to this day remains a relatively inexpensive slice of Southwest Florida. There is wide architectural variety for single family homes or multi-family homes as well as condominium towers that mimic the type of lifestyle enjoyed by residents of luxury resorts. A sizeable number of the communities in Naples have fitness centers with regularly scheduled activities, community swimming pools and spas, and tennis and basketball courts, enhancing an active resident’s experience many-times-fold. What would a city be without shopping and restaurants? Practically everywhere in Naples is only a short walk or short drive away from a shopping center bursting with designer stores, hobby shops, Mom-&-Pops, high-class restaurants, family dining chains, and local dives. Popular locations include Mercato in North Naples where you can even purchase properties above the shops overlooking the main drag, Waterside Shops - an open-air mall winding around water features and well-maintained landscaping features, and, of course, Naples’ famous Downtown and 5th Avenue-adjacent areas with a vibrant evening-life and numerous events hosted every month. Naples is host to multiple A-ranked schools both public and private, making this a great town for a family to call home. Many of the schools have active sports teams, orchestras, and academic teams that compete at the local, state, and even national level. There are many public parks with sports fields in Naples including Veterans Park, Vineyards Community Park, and the newer North Collier Regional Park. North Collier Regional hosts the popular Sun-N-Fun Lagoon, a state-of-the-art water park, 5 tournament softball fields, 8 tournament soccer fields, Calusa Fossil Dig Play Area for Children and Families, and much more to be explored and enjoyed! This city has maintained its pristine image through thick and thin – it came out the other side of Hurricane Irma in 2017 with mostly aesthetic damage. The city cleaned itself up fairly quickly after that and looking at Naples now you might not even know that a highly destructive storm had raged through only a short while ago. That being said, Naples averages around 260 days of sunshine a year, as opposed to the United States’ average of 200. That’s two whole months-worth of extra sunshine! Florida typically gets more rainfall than in other parts of the country, but it is mostly during the summer months – the wet season. It can jokingly be said that Naples only has two seasons: wet season and snowbird season. A Snowbird is an affectionate nickname referring to part-time residents who live in the North during the Summer and come down to a warmer climate during the winter. While longtime Neapolitan residents have reported isolated sightings of snowflakes, the annual average lowest temperature is in January and is merely a brisk 53° Fahrenheit. Florida’s humidity is another draw for people from all over. For those who find drier climates wreak havoc on their breathing or their skin, Naples is a refreshing retreat that may end up becoming their new home so they can fully enjoy their lives. 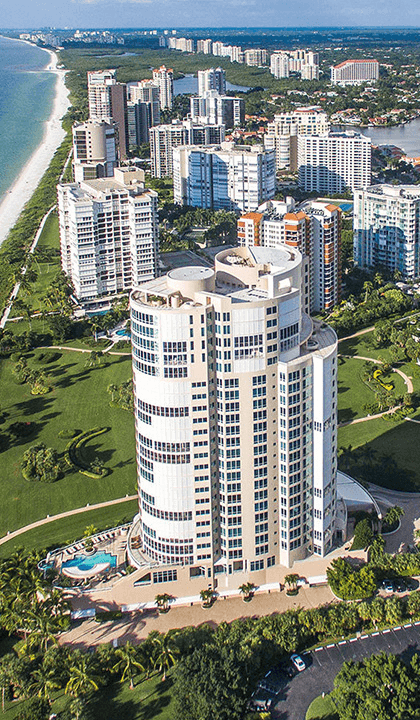 Naples Real Estate - Naples offers a huge range of styles of homes – from modest Old Florida-style homes to Italian villas with hundreds of feet of waterfront property and Gulf access by boat. There are many gated communities in the Naples area, offering an air of exclusivity everywhere you go. Floor plans vary between wide, open-concept condominiums with a terrace to modest, yet stylish and cozy carriage homes. Well-maintained landscaping abounds throughout the various communities with bright, colorful tropical flowers and tastefully-placed trees. Some communities in Naples are tailored to fit along with certain lifestyles such as making life convenient and comfortable for golfers, boaters or nature-lovers. Golfing communities especially are a prime attraction to Naples; home to acres and acres devoted to golf courses and their support network. The true jewel to many, though, is owning a home close enough to the coast to enjoy Naples world-famous sunsets. There are also many communities with waterfront properties with canals that lead straight into the Gulf of Mexico. The biggest draw of Naples has to be its beaches. In 2005, Naples’ beaches were voted the best in America by the Travel Channel! From Barefoot Beach in the North down to Lely Barefoot Beach, there are numerous well-maintained public beaches. As an example: Delnor-Wiggins Pass State Recreation Area/Beach at 11100 Gulf Shore Drive in Naples is open from 8 am until Sunset every day and facilities include five parking areas, picnic tables, barbecues, boardwalks, showers and bathhouses, an observation tower, boat-launching ramp and everything you can expect from a beach and more! Walk miles with the tide gently lapping across your ankles and then mere feet off the beach into local restaurants and bars that feature live music. Meet new people from across the world sitting side-by-side with native locals all sharing in the wonderful and friendly atmosphere. Alternatively, take a long walk down to the end of Naples Pier and enjoy the fishing opportunities alongside fellow enthusiasts or just to enjoy the beautiful long view of the water washing ashore for miles and miles to the north or the south. If you keep a careful eye out, you can spy dolphins playing in the deeper water towards the end of the dock! This is a town with an active social life – there are many local events and activities including local art and music festivals along famous 5th Avenue and around the beating heart of the city. The Naples Half Marathon is held annually (going strong since 1989) with a strong turnout every year with a record of 2,038 runners in the 2013 event. Runner’s World magazine has called this event one of the best half-marathons in the whole country. Naples has a running self-instated claim that it is the “Golf Capital of the World” and that it has a higher number of holes per capita than any other community anywhere. Most of the golf courses in Naples are private, which affords shorter waits between games and less crowded greens for residents. This seems like it is purely to the detriment of non-residents of these communities, but a number of the courses have reciprocity agreements with public golf courses during the summer. This gives non-members the opportunity to golf on courses designed by the greats such as Arnold Palmer, Jack Nicklaus, and Arthur Hills. This is not a city you will want to miss!